A handwritten letter in which Albert Einstein grappled with God, the Bible and his own Jewish identity will go up for auction on Dec. 4 at Christie's auction house in New York City. This infamous "God Letter," penned a year before Einstein's death in 1955, is expected to sell for between $1 million and $1.5 million, according to a statement from Christie's. Einstein penned the letter in January 1954 to religious philosopher Erik Gutkind after reading "a great deal" of Gutkind's book "Choose Life: The Biblical Call to Revolt" (Schuman, 1952). While Einstein began his letter (written in German) by praising Gutkind for sharing a common impulse of "striving for the improvement and refinement of existence," he soon took issue with Gutkind's religious ideals. "The word God is for me nothing but the expression and product of human weaknesses, the Bible a collection of venerable but still rather primitive legends," Einstein wrote (translated into English). "No interpretation, no matter how subtle, can (for me) change anything about this." Further in his letter, Einstein turned a critical eye toward his own Jewish identity, specifically questioning the assertion that Jews are a "chosen people." "The Jewish people to whom I gladly belong, and in whose mentality I feel profoundly anchored, still for me does not have any different kind of dignity from all other peoples," he wrote. "As far as my experience goes, they are in fact no better than other human groups, even if they are protected from the worst excesses by a lack of power. Otherwise I cannot perceive anything 'chosen' about them." Peter Klarnet, senior specialist in books and manuscripts at Christie's, said in the news release that Einstein's letter is "one of the definitive statements in the Religion vs Science debate" — a debate that the physicist did not hesitate to join throughout his career. Einstein vocally rejected the idea of a personal God who concerned himself with the comings and goings of human beings, but likewise did not consider himself an atheist. In a letter penned in March 1954, he explained, "If something is in me which can be called religious, then it is the unbounded admiration for the structure of the world so far as our science can reveal it." 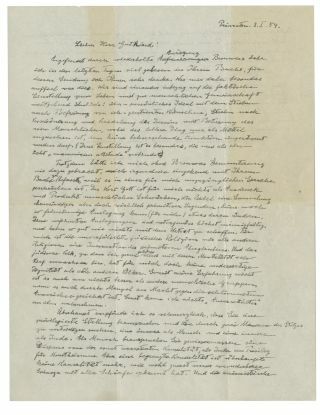 Einstein's "God Letter" sold previously at auction on eBay in 2012, where an anonymous buyer purchased it for $3,000,100. Prior to that, in 2008, it sold at a Bloomsbury Auctions sale in London for $404,000 — roughly 25 times its presale estimate, Live Science previously reported. This time, you need not be a millionaire to see the "God Letter" in person. Christie's will put the letter on public display in New York from Nov. 30 until the auction begins on Dec. 4.